Brussels Griffon Dogs - The Brussels Griffon or Griffon Bruxellois is a breed of toy dog, named for the city of their origin, Brussels, Belgium. The Brussels Griffon may refer to three different breeds, the Griffon Bruxellois, the Griffon Belge and the Petit BrabanÃ§on. Identical in standard except for coat and colour differences, in some standards they are considered varieties of the same breed. All three breeds are generally small, with a flat face, prominent chin, and large wide-set eyes that give the Griffon an almost human expression. In the Griffon Bruxellois and the Griffon Belge, the coat is wiry and harsh. 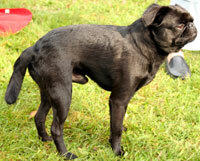 In the Petit BrabanÃ§on, the coat is short, smooth, glossy, and flat, rather like a Pug or Boston Terrier. The Brussels Griffon is known to have a huge heart, and a strong desire to snuggle and be with his or her master. Griffons tend to bond with one human more than others. This, along with their small size, may make them unsuitable as a family pet, especially for a family with very small children. Having a Griffon means having a true constant companion. They need their favorite person all the time, and will be very unhappy if left outdoors or alone most of the day. This information is licensed under the GNU Free Documentation License. It uses material from the Griffon Bruxellois article on Wikipedia.org. Brussels Griffon Breeders - Advertise your kennel puppies and dogs here.